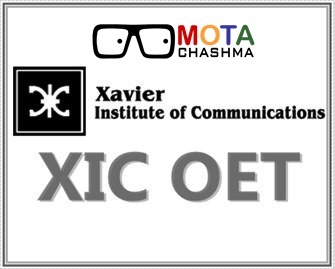 XIC OET - Xavier Institute of Communications Admission 2018 - XIC OET 2018 is an entrance exam which invites admission to several postgraduate diploma courses in communications from XIC Mumbai (Xavier's Institute of Communications). The application process of XIC OET 2018 will start from 1 April 2018 for the admissions to the 2-year full-time Post-Graduate Diploma in Communication conducted in Xavier Institute of Communications. The Institute is at two locations; the St. Xavier's College campus and the St. Xavier's High School Campus, Mumbai. The age of the candidate should be 35 or below to apply for any of the course from XIC Mumbai. The Candidate will be shortlisted on the basis of XIC OET 2018 (Online Entrance Test) which will be the 90-minute test conducted across 5 test centres in India. The candidate should have completed 3 years of Graduation in any stream of India. Candidates with 2-3 years of work experience in related field such as NGO/ Pvt. CSR division is preferred. Candidates appearing in last year examination are also eligible to apply. The aspiring candidates can fill the online application form through official website of XIC Mumbai or by following the link given below which will be available from 1 April 2018. Applicants have to appear in the XIC OET Entrance Exam 2018 to be eligible for Xavier Institute of Communications Admission 2018. STEP 1: Candidates need to register themselves on the official website of XIC or by following the link given above. STEP 2: After registration, candidates have to fill the application form and have to upload his/her photograph and the relevant documents in the given format. STEP 3: At last, candidates have to pay the application fee through Debit Card/Credit Card/ Net Banking. STEP 4: Applicants have to take the printout of the application page after the successful submission for the future references. The candidates are suggested to check the details of the duly filled application form before submission. After paying the application fee via online mode applicants have to click the submit button, after which applicants will be redirected to the confirmation page. Candidates should keep at least two copy of the application form for future reference. There is no offline process for submission of the application form. XIC OET 2018 result will be declared on the same day of the entrance exam. The candidates will get the result online. After qualifying the Entrance Exam, the candidate will go for the further selection process. The selection process of the candidates is done with a view to identifying the skills in addition to the overall knowledge. The applicants will be shortlisted on the basis of the listed below parameters. The Online Entrance Test (OET) will carry the total of 150 marks which contains two sections the Objective section and Subjective section for which 60 minutes will be allotted for the Objective section and 30 minutes will be allotted for the Subjective section. XIC OET Exam Syllabus for each section is separate. The Objective Section will consist of questions based on Language Skills, General Knowledge and Knowledge of Media, Logical, and Analytical skills. The Subjective Section will consist of question could be media related in order to assess creativity, social values, writing skills, etc. Some questions will also be related to the courses the candidates have applied for.